Food prep’s best friends? Kitchen knives. You don’t need a lot, but for efficient and safe food prep, you need some really good quality knives. So amount? Pros say the three basics are a chef’s knife for chopping, a paring knife for peeling, and a bread knife for slicing. A fourth cutting item would be a good pair of kitchen shears. And efficiency and safety? Pros say knives MUST be sharp. Seems like an oxymoron—a sharp knife is safe? You’d think the duller the better for safety. But nope. A dull knife is at the top of the list for causes of kitchen mishaps in the food prep arena. So this said, take a look at what I found on a favorite site, Food 52 (www.food52.com). These tips on how to keep your knives sharp come from Bob Kramer, a legendary knife guru and one of fewer than 200 people in the world to be certified as a Master Bladesmith (who knew there was such a title?). 1. 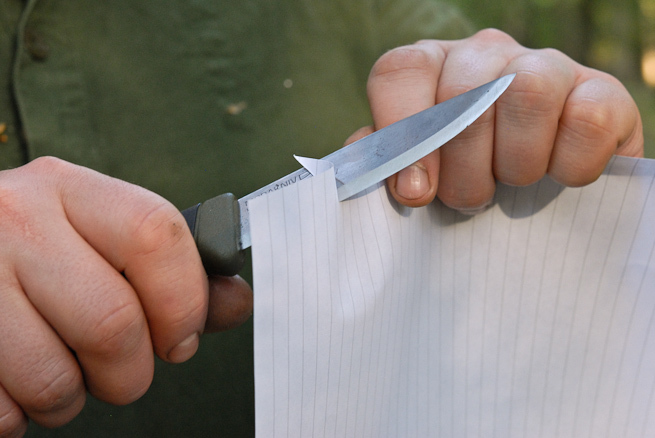 The best way to test your knife is with a piece of paper. 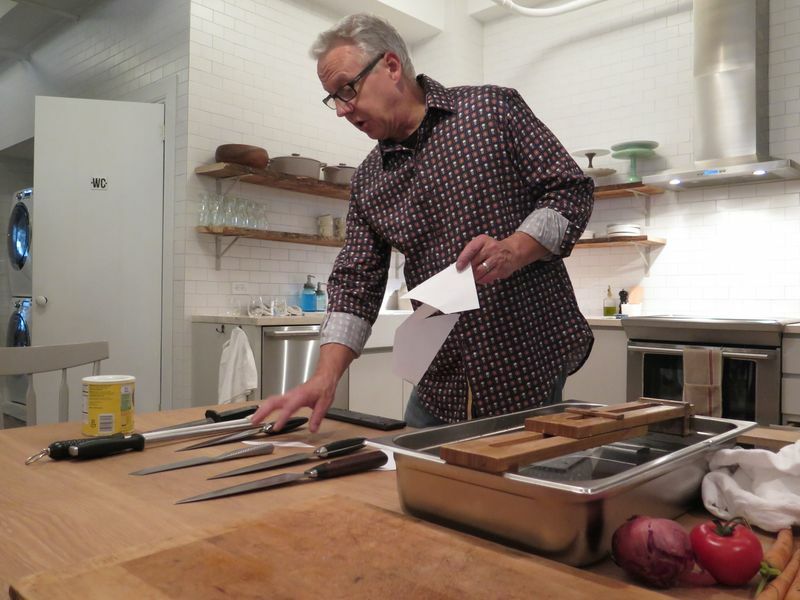 If you're wondering whether you should sharpen your knives—which Bob suggests doing roughly three times a year—cutting through a piece of paper is the best way to find out if they really need to be. "I'm looking for a razor edge," Bob said, holding a knife with one hand and a piece of paper in the other. "Just as a razor that encounters hair splits it easily, a knife should cleanly cut whatever it encounters." His knife slid cleanly, straight through the piece of paper. 2. If you've never sharpened a knife before, start with a paring knife. 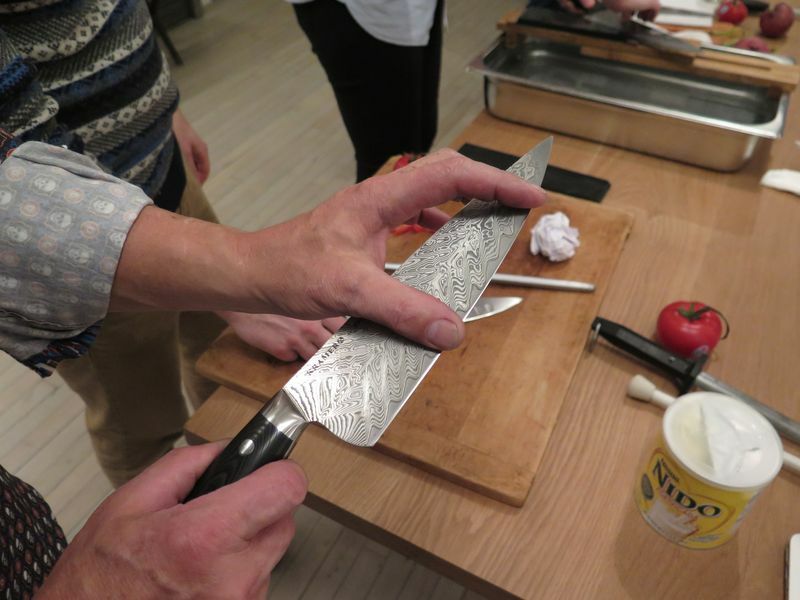 Bob recommends starting with an 8- to 10-inch plastic paring knife, which will be lighter and smaller and therefore easier to manage than a chef’s knife. Also, when you're starting out, try to avoid using knives that have bolsters (the curved, metal part of the knife that joins the blade and handle) which can catch on the whetstone during hand-sharpening. 3. It's almost impossible to do irreparable damage to your knife on a whetstone, even if you're a total novice. At one point, Bob did the unthinkable and sawed the blade of a beautiful, high-end knife back and forth directly across a whetstone stone so that the knife could barely cut at all. But with just a few swift correct strokes on the sharpening stone (the blade angled 15-20° with balanced pressure applied in a steady arcing motion) he was able to have the knife back to working order. "The most damage you can do is running your knife too flat along the stone and scratching the side, which might bum you out but functionally, your knife will still be fine," he explained. 4. Honing your knife is as important (if not more!) than sharpening. Just because a knife isn't cutting cleanly doesn't mean it isn't sharp; it might just be out of alignment, or the sharp edge is rolled over. 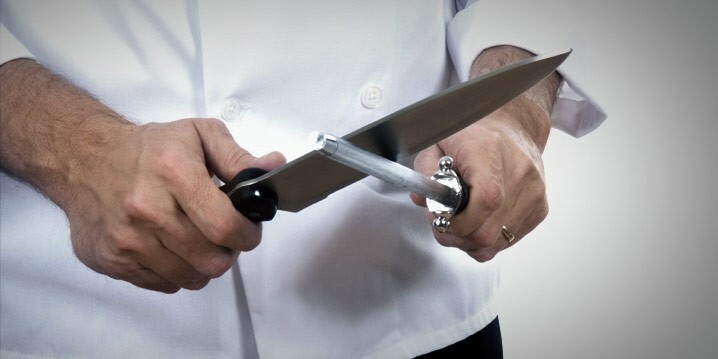 The best tool to test whether your knife is "rolled"—which happens when a knife goes over a hard surface, like a serving platter or a pan, bending the sharp edge slightly over to one side—is your thumb. Bob demonstrated the area of the knife that gets the most wear, but noted that it’s equally important to make sure the bottom and top of the knife get sharpened, as they're easy to miss. 5. When sharpening, apply more pressure than you think you need. 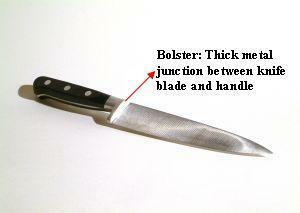 A lack of adequate applied pressure, Bob said, is one of the most common mistakes he sees in knife sharpening. To make sure you're applying the correct amount of pressure (four to six pounds for a relatively in-shape knife, eight pounds for an extremely dull blade), press down on a kitchen scale until it reads the correct weight, then apply this same amount of pressure to your knife on the sharpening stone. 6. Whetstones are not one-type-fits-all. Whetstones come in a number of gradients, or coarseness. Lower grits, around #400, have a more textured surface area and can be used to reshape knives and repair chips—they shave off the most material. 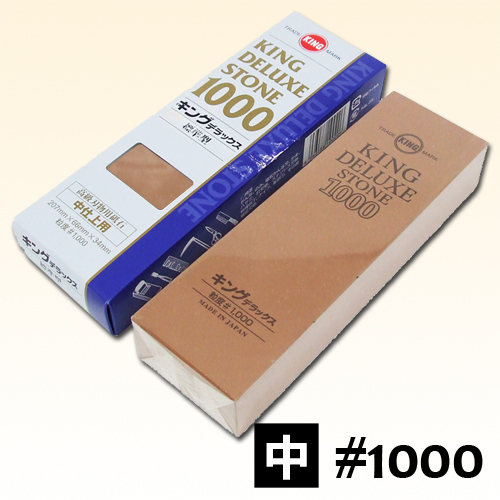 Higher grits, like #1000 are best for polishing and basic sharpening—if you're only going to buy one stone, this would be it. And the highest grade stones, around #8000 are used for smoothing and polishing your edge. 7. 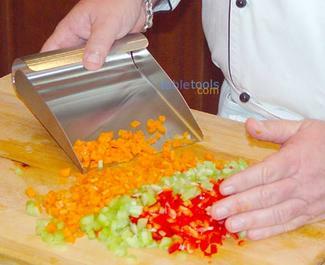 The angle at which you sharpen your knife matters. Expert knife sharpeners use specific degrees for specific tasks: "If you're splitting chickens all the time, 20° per side will give you more strength. If you're cutting cucumbers, go for 10° per side will make it really slick and efficient," Bob said. But if you're just starting out, Bob recommends 10° to 15°. If you aren't sure what this looks like, lay your knife on the sharpening stone and place a matchbook under the blade, then remove the matchbook and keep the angle; this is about 15°. 8. Having good cutting technique is essential for knife maintenance. "You never want to run your blade across the board sideways," Bob said, which can roll the edge and make it duller faster. When chopping on a cutting board, be careful not to use your knife to slide the thing you are chopping into a pile, or to use your knife to brush it off into a pan. That's what your hands or a food scoop is for. 9. 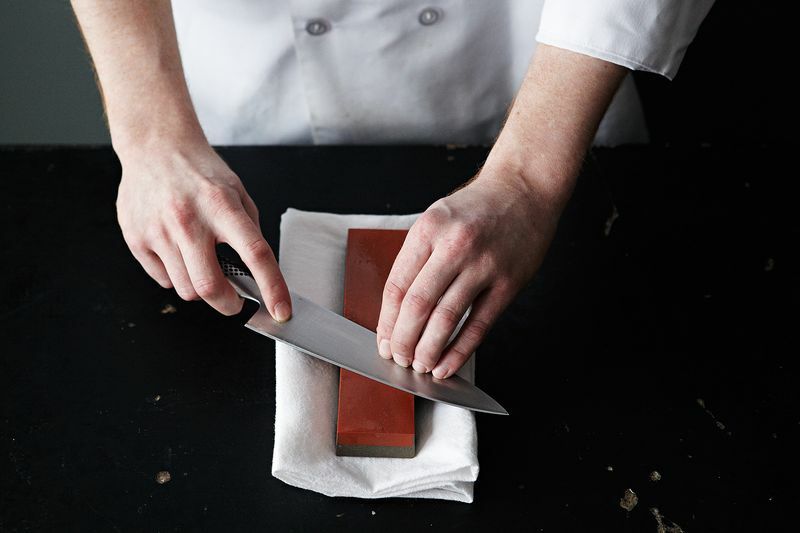 Even the lowest quality knives benefit from being sharpened and honed. "Even if you have a low-quality knife, you want that low-quality knife to be the highest quality it can be," Bob said, "it's important to care for your knives—no matter if you have a $200 knife or a $30 knife."